The Bruins have the Philadelphia Flyers to thank for this dominating win versus the Capitals. The Bruins beat the Capitals 3-0 behind goals from Greg Campbell, Loui Eriksson and Brad Marchand and Tuukka Rask's 6th shutout of the year. 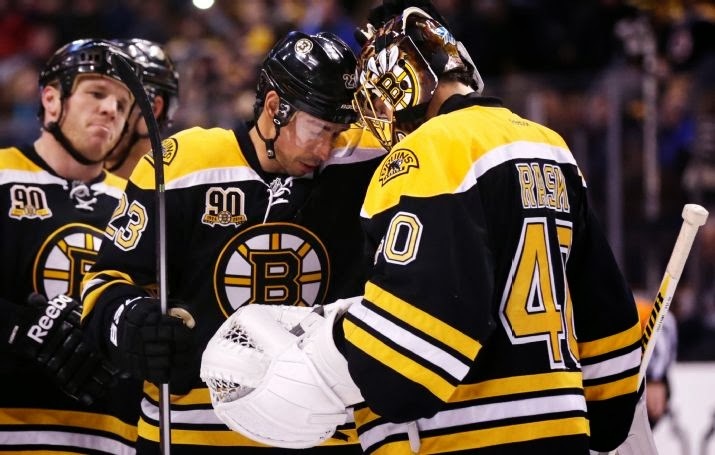 It's the Bruins' 40th win on the year and gives them 85 points on the season. After playing so poorly in their first two games after the Olympic break, the Bruins have turned in three solid performances and righted the ship, outscoring their opponents 13-4. After playing an emotionally draining game last night in Philly (made complete with a raucous line-brawl) the Capitals had to fly into Boston and play the Bruins tonight, and needless to say, the Capitals did not have much in the second leg of the back-to-back. The Bruins were attacking the Capitals end the entire night, and doing so with some awesome give-and-go's, one touch passes, crisp breakouts, puck possession and strong defensive play in their own end. Not to mention the three goals scored and none given up. The Bruins outshot the Caps in every period of play, to the tune of 10-4 in the first, 17-4 in the second and 16-8 in the third. The totals read 43-16, the first glaring stat that showcases just how bad the Capitals were. A scoreless first period saw Boston dominating the play, getting a few decent chances on net, but no goals came of the pressure. Tuukka Rask made a big save late in the period on a 3-on-2 breakaway by the Caps, when Carl Soderberg broke his stick in the offensive zone, leading to the rush the other way. Rask went side-to-side to make the save and keep the 0 on the board. The breakthrough came at 3:05 of the second, when Greg Campbell deflected home his seventh goal of the year off a Patrice Bergeron slapshot. It's Campbell's fourth goal in four games, as he now leads the Bruins in the month of March in goals scored. As you'd expect. Matt Bartkowski registered the other assist on the play. Hey! Who said anything about a trade!? 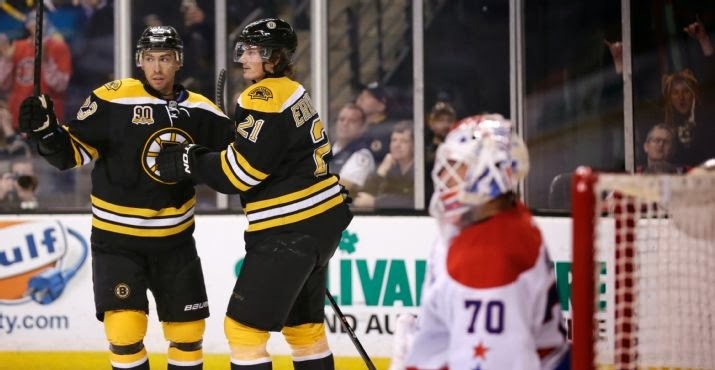 Loui Eriksson made his case that he's worth it a day after some speculation made the rounds he was on the block, as he made it 2-0 five minutes later at 8:20 with his seventh of the year. After some awesome work by the third line, including the diving face-off win by Chris Kelly, Carl Soderberg played the Kevan Miller shot from the blueline off the boards, rounding the net and finding Eriksson who was boxing out just beyond the crease. Loui corralled the puck and roofed it past Holtby. The Bruins wound down the rest of the game, and if it wasn't for some impressive saves from Holtby, the scoreline could've been much higher. Braden Holtby had to ruin the fun for a bit late in the third when he robbed David Krejci that would've put the icing on the cake. Again, it was more of the same of what we saw from the Bruins: a controlled breakout from their own zone, a tap pass from Milan Lucic that met Jarome Iginla in stride, and the tape-to-tape pass across the ice to Krejci. But Holtby stretched out and gloved it down. But Brad Marchand found the empty net with a 1:30 to go, fighting through a stick-check from Mike Green from just inside the blueline to send the puck into the open net. It was Marchand's 21st of the year, which still leads the team. It's the Bruins third win a row, and the mini-two game losing streak last week seems to be mile behind this team. They've gotten back to the basics and the structure that makes them such a great team. The Bruins visit the Tampa Bay Lightning on Saturday at 7 p.m., and if they can man up and beat the Bolts, they could go 10 points clear and effectively eliminate Tampa from competing for the division title. Greg Campbell scored his fourth goal in four games, and at this pace he'll be in line to take over the league lead by the end of March. Watch your back, Ovie. With the win, the Bruins improved to 25-7-2 at home on the season. The shutout was Rask's 22nd of his career. Don't look now, but Boston now sits just one point behind Pittsburgh for the top spot in the Eastern Conference. Bruins captain Zdeno Chara logged just 20:38 in ice time, his fourth lowest total this season, and the least he's skated in since January 28 versus the Panthers. Are the Bruins making an effort to take some strain off the big guy? It sure seems it with the grueling March schedule laid out before them. And who needs more trades?! Of course the Bruins would shutout the first team they play after the trade deadline in which so many people (me included) wanted them to add a bit more in defensive relief.